Happy December. I am coming back to the US for Christmas in less than 3 weeks! Well, it’s been longer than I promised in my last post, as usual. Last weekend we celebrated Thanksgiving. Here, Thanksgiving day was just another work day, so no one did much of anything special. In my classes, I asked my students to write down eight things that they are grateful for, and then fold the paper to put in their pocket so that they could look at it again later in the day. And part of their homework that day was to tell someone in their life that they are grateful for that person. Many of my students and my host family asked me about Thanksgiving, and specifically what religion it is from. People here, as in much of the world, know of Thanksgiving, but don’t know much about it, and their natural assumption is that, like Christmas, it is a religious holiday. They are surprised to hear that it really isn’t. Of course, Thanksgiving began as a gathering among people of the same religious tradition, and they were thanking God for what they had, their survival and the assistance of the American Indians. However, today, it is just an American holiday, and has no affiliation with any specific religion. Americans ought to do a better job of exporting this holiday instead of Levi jeans and pizza. Well, last weekend, I participated in two Thanksgiving celebrations. On Saturday evening, I went to a friend’s apartment for a bigger-than-I-was-expecting party, hosted by her and one of her colleagues. They had the whole meal catered and it was surprisingly authentic. We had turkey, and mashed potatoes, and sweet potatoes (real, orange ones), and cranberry sauce. This friend had been in Washington, DC just before Thanksgiving and, there, was able to buy cranberry sauce to bring back. There are no cranberries here. On Sunday, I hosted a Thanksgiving dinner at my house to share with my host family. The party included my host family – host parents, two host sisters, and host brother who currently lives with his mother – and six of my teacher friends from work. Instead purchasing and making a turkey, since I don’t know where to get one and I’ve heard they are quite expensive, I bought two chickens from a polleria (chicken store) in my neighborhood. Roasted chicken is a staple here, so it’s wasn’t exactly special, but a whole lot easier than cooking a turkey myself. I made stuffing with white bread, giant green onions, green apples, celery, and garbanzo beans. The recipe called for roasted chestnuts and leeks, but I couldn’t find chestnuts here, and I had to use a type of onion that is similar to a leek, but not a leek. It turned out well. I’m not sure garbanzo beans are a great substitute for chestnuts, but they have a similar shape and were the only reasonable alternative. I also made caramel popcorn, which is surprisingly easy and immune to altitude related baking mishaps. I even popped my own popcorn in a pot and hardly burned any of it! I found some tips on line which helped, since I had never, ever popped popcorn that way before. The secret is to put three table spoons of oil in a pot with 4-5 kernels of popcorn and heat the pot until the kernels pop. 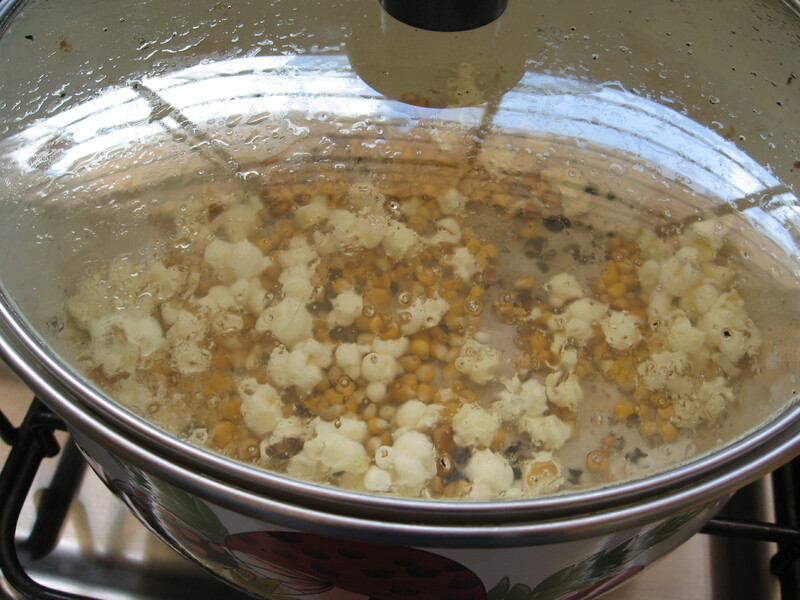 Then remove the pot from the burner and add a third cup of kernels. Put a lid on the pot and let it sit for 30 seconds. Then put the pot back on the burner. The 30 second wait allows all the kernels to heat to near-popping temperature, and then when you put them back on the heat, they quickly reach popping temperature and all pop at about the same time. 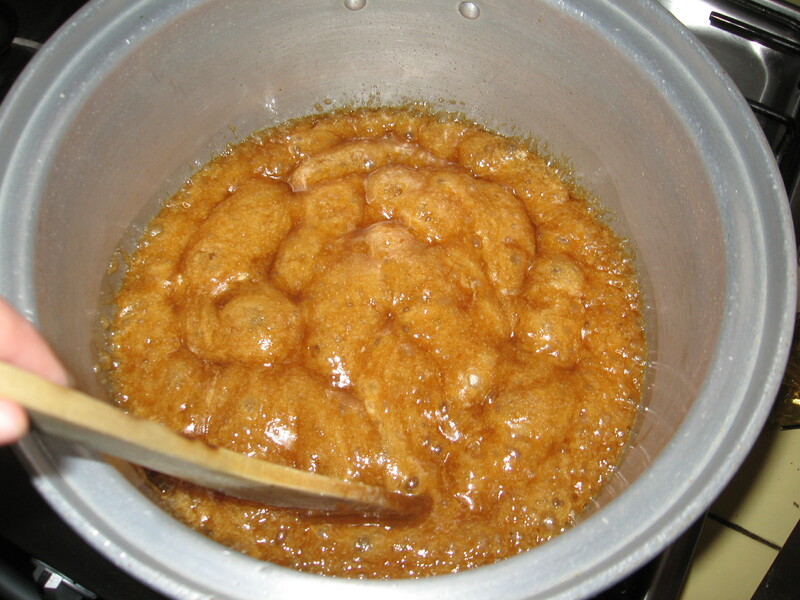 The caramel is made from corn syrup, brown sugar and butter boiled together with a little bit of baking soda (or in my case, baking powder, for reasons explained in previous posts). 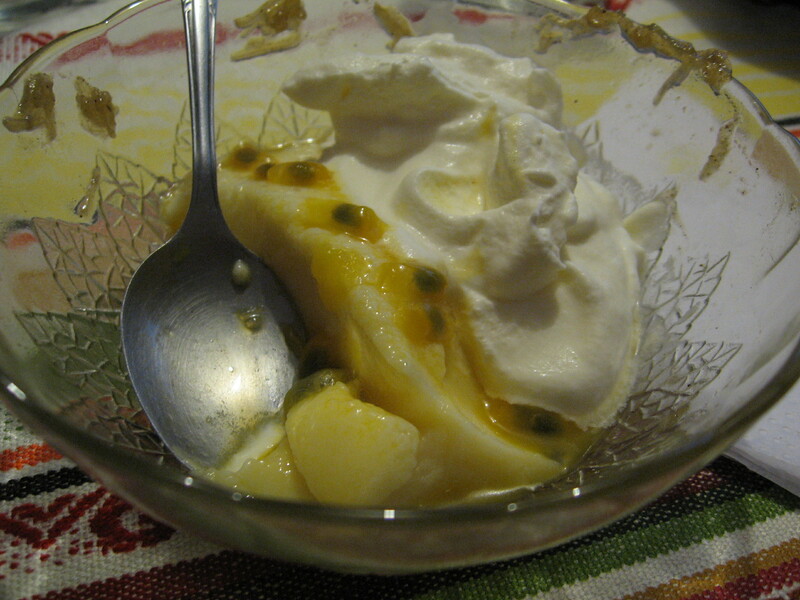 Finally, I made maracuyá (passion fruit) mousse. I accidentally did a few steps in the recipe wrong, so I thought it was going to fail and not set properly, but after 7 hours in the refrigerator it came out fine, and tasted amazing. For those who have never seen or tasted a maracuyá, it is an oval-shaped fruit a bit smaller than a mango. The rind is sturdy and the inside is just a goupy mess of juicy globules with edible, black seeds inside. They are quite tart, so the recipe called for 1 ¼ cups of sugar. I found the recipe on an Ecuadorian cooking blog http://laylita.com/recetas/2011/08/29/mousse-de-maracuya-receta/#more-548. 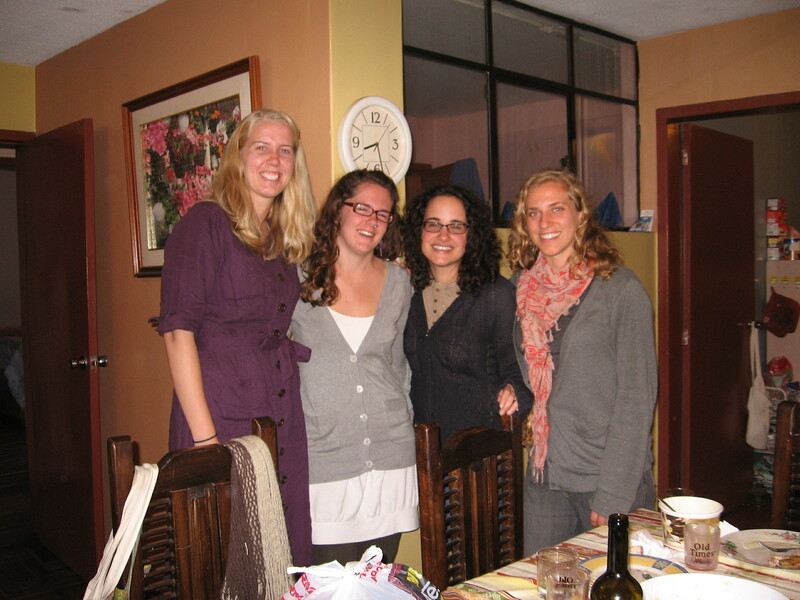 Hosting in Ecuador can be a bit of a challenge as punctuality is not a strong suite of Ecuadorian culture. I confess that even I have become very relaxed about timeliness. So, I told my American friends that the gathering would begin at 3:30pm. My first guests arrived at 2:30pm, because my friend remembered being told to arrive at 2pm. Then two more arrived at about 3:50pm. We waited until about 4:15pm, when we heard that the three other guests were going to be late because they remembered the hour of 5pm and were only just returning from the grocery store. So, my first three guests and the family decided to eat at about 4:30pm. My friends had brought sweet potatoes – which it turns out are purple here –, salad, and an accidental dessert made from a fruit/vegetable, which a guy at the store had told them was like a squash, but apparently wasn’t. 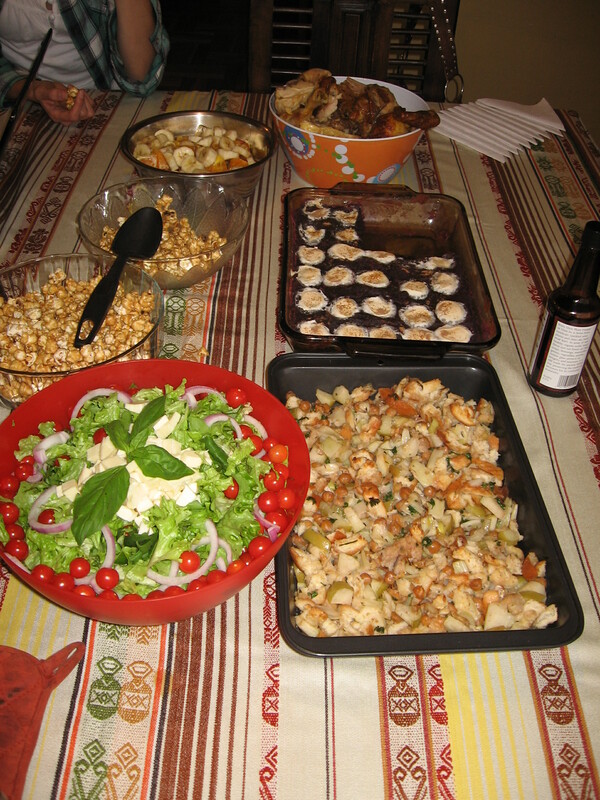 So we had a delightful feast and good Spanish conversation among the nine guests at 4:30pm. In other news, we have two weeks of classes left, one of which is a two day week because Monday and Tuesday are holidays. I will be moving to an apartment either right before I leave for Christmas, or right after I return to Quito in January. A friend from work and I are moving there together. It is in a neighborhood much closer to our school than where I live now. We’ve agreed to speak only Spanish in our house, which won’t be as perfect as living with a family, but still an important opportunity to practice. I will miss my host family a lot, but I’m ready for a change. 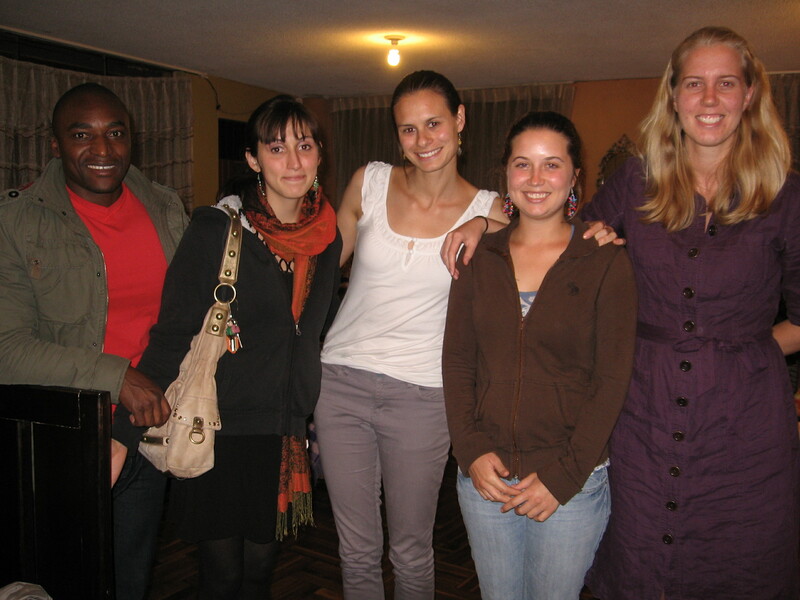 They are wonderful and I have enjoyed my time here immensely. I’ve decided to move because I feel like I’m just a person living in their house now, and not a family member anymore. This is mostly because my independent social life here has evolved such that I don’t spend a lot of time at home or with the family like I used to. I miss spending time with them, but it is harder and harder to coordinate, and I like my independent life. 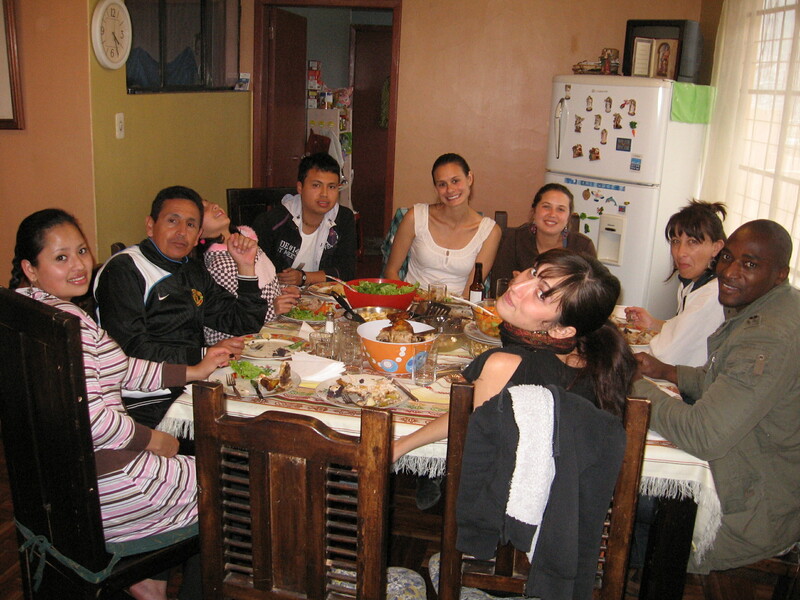 Ecuadorian families are very close knit, which I love about this one, but that is difficult to balance with a social life outside of family. And having social connections with people from my culture is equally important to me. Hopefully, once I move out, we can all just be friends who make time to visit each other, instead of family members who don’t have time for each other. I’m excited to be in a different neighborhood, to cook for myself, to have my own space, and to not share a bathroom with four other people! Love the details on your cooking! I’ve enjoyed all your posts…thanks for sharing! Thank you for another story about some beautiful days. It is amazing that you could just let your Thanksgiving dinner flow with the random arrival times of your guests. Another wonderful insight into life in Ecuador. You do an incredible job of cooking and entertaining and sharing with your friends there.